Interested in a tour of our Retirement Community? Contact us and find out just how easy it is for you to leave your cares and live your life at Residence on the St. Clair! For more information or a personal tour, call 519-336-1455 or email us. 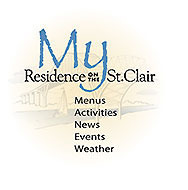 A Residence on the St. Clair representative will be happy to assist you. Thank you for your interest and we look forward to hearing from you soon.